From afar, Farg & Blanche’s gorgeous stool looks round and plush. But on closer inspection ‘Nailed Succession’ could double as a torture device for the would-be sitter. 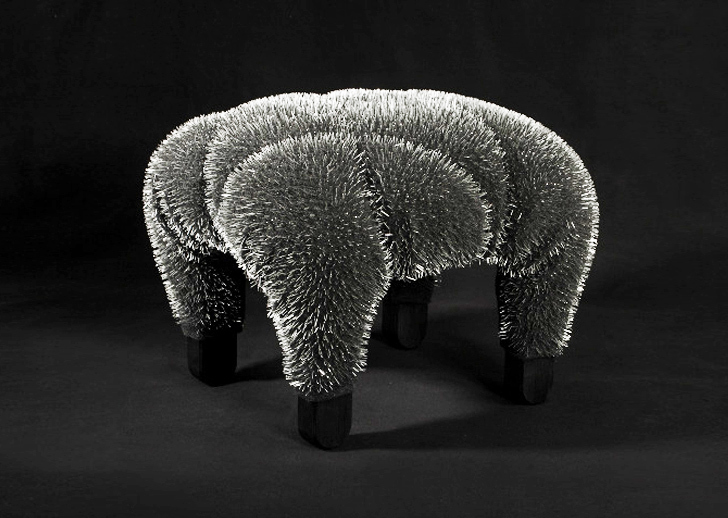 Shown at the London Design Festival, the glittering seat is actually made up of 12,000 sharp staples, all pointed toward an unsuspecting user’s derriere. The spikey stool designed by the Swedish duo of Farg & Blanche looks upholstered from a short distance, with puffy patterns that elude and invite the viewer to take a load off. But the shimmery sheen of the “upholstery” is actually light catching thousands and thousands of upcycled staple ends. Their brackets facing in, the points from each staple have been repurposed as sparkly adornments for the piece. More of a sculptural work than a piece of furniture, Nailed Succession may be an accident waiting to happen, but still manages somehow to convey a refined sophistication. The cool silver of the staples takes on a rich and decadent feel when grouped along the curvaceous lines of the stool’s surface. The repurposed staples take on an almost fur-like texture, their ends becoming bristles, or like porcupine quills. Called “brutal” by the designers themselves, this clever stool pokes fun at the world of furniture design while creating a beautiful example of upcycled art. From afar, Farg & Blanche’s gorgeous stool looks round and plush. But on closer inspection 'Nailed Succession' could double as a torture device for the would-be sitter. 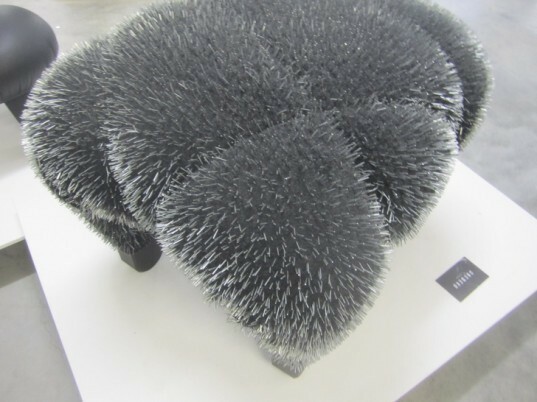 Shown at the London Design Festival, the glittering seat is actually made up of 12,000 sharp staples, all pointed toward an unsuspecting user’s derriere.